Downtrend prevailed during last week. Continuation of phasing out of QE3 in the USA provided additional support to the USD and increased investors’ interest to the American currency. 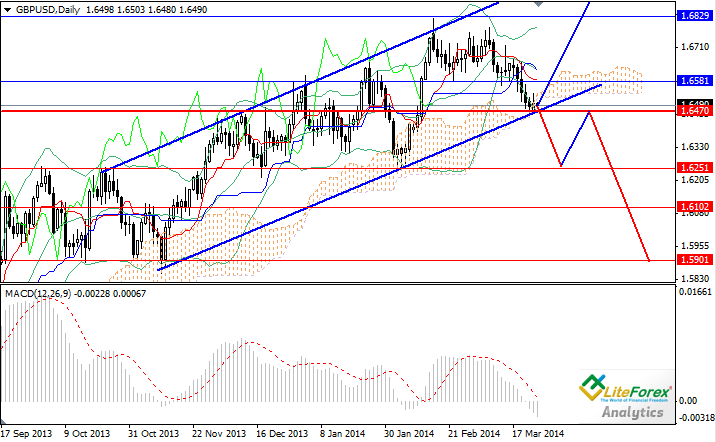 The pair GBP/USD lost over 200 points and consolidated at the key support level of 1.6470. Due to lack of British and USA news yesterday, the pair traded in the narrow channel. The level of 1.6470 is psychologically important mark and breakout of this level will trigger long-0term decline in the pair. British indices of retail, purchasing, consumer and distributing prices will become known today, as well as US index of consumer confidence and the data on construction sector. All forecasts are negative. If the “bulls” manage to drag the pair below support level of 1.6470, decline will continue up to the levels of 1.6250, 1.6100 and 1.5900. Alternative scenario: rebound from the level of 1.6470 and the rise in the ascending channel with the target of 1.6910-1.7000. Support levels: 1.6470, 1.6250, 1.6100 and 1.5900. Resistance levels: 1.6580, 1.6830, 1.6910 and 1.7000. It is recommended to open long positions with profit taking at the level of 1.6600 and short stop-loss. It is also advisable to place sell orders below the level of 1.6450 with profit taking at the level of 1.6250.